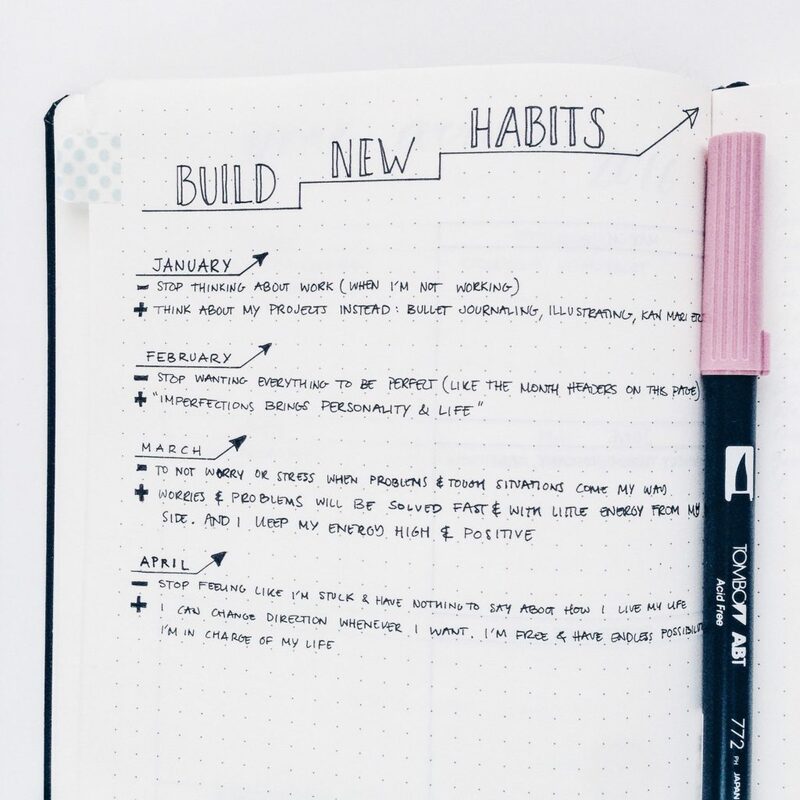 In an earlier blog post (Bullet journal mistakes + how to survive them) I talked about my collection ”Build New Habits”. Or as I should have named it to be more accurate ”Build New Mindset” or ”Growth Mindset”. It’s my way of changing my mindset from being stuck with thoughts I feel aren’t helping me, to a more positive mindset. It helps me to stay actively in charge of my own energy levels. The idea is to take a thought that you feel is holding you back, is negative or is consuming too much of your energy and flip it to a positive mantra. And by ”mantra” I really just mean a positive phrase or sentence(s). Then whenever you have that ”negative thought” (I’ll call it negative thought from now on, but it is anything that holds you back, drains you of energy or simply an idea or thought you do not wish to have) simply say ”thank you, I hear you” and instead put your focus on the mantra. That just means that you think of it or say it out loud, which ever works best for you (and your surroundings ;)). You will most likely be able to repeat the mantra just a few times before your mind wanders. And that’s ok. Just keep doing this time and time again, and you’ll notice the difference. By taking charge of your thoughts and feelings you will soon realize that this has a major impact on your energy. Going from being irritated, sad or just having a negative feeling in your body, you’ll let go of that feeling and as you let go you’ll notice how you feel more free, like a dark cloud has lifted from your mind. At least that’s how I feel. 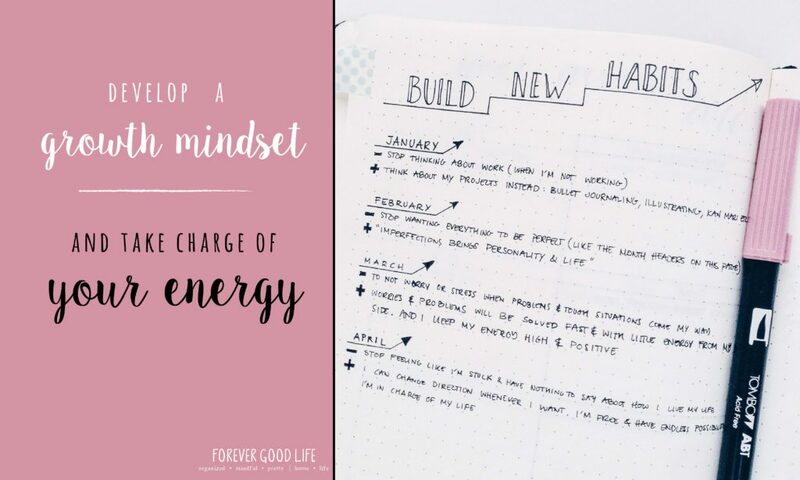 You might feel something different, but I’m sure that by keeping up with this process it will help you build a growth mindset and most importantly you’ll be actively in charge of your energy levels. In this blog post I’m talking about how I’ve decided to pick one specific mantra to focus on for a month. But the truth is that besides that monthly mantra, I might come up with new mantras to help me tackle other issues I’m dealing with during that month. That’s just the way I handle situations where I get irritated, frustrated or disappointed. I just wanted to let you know as I think this process helps me a lot for those situations as well. 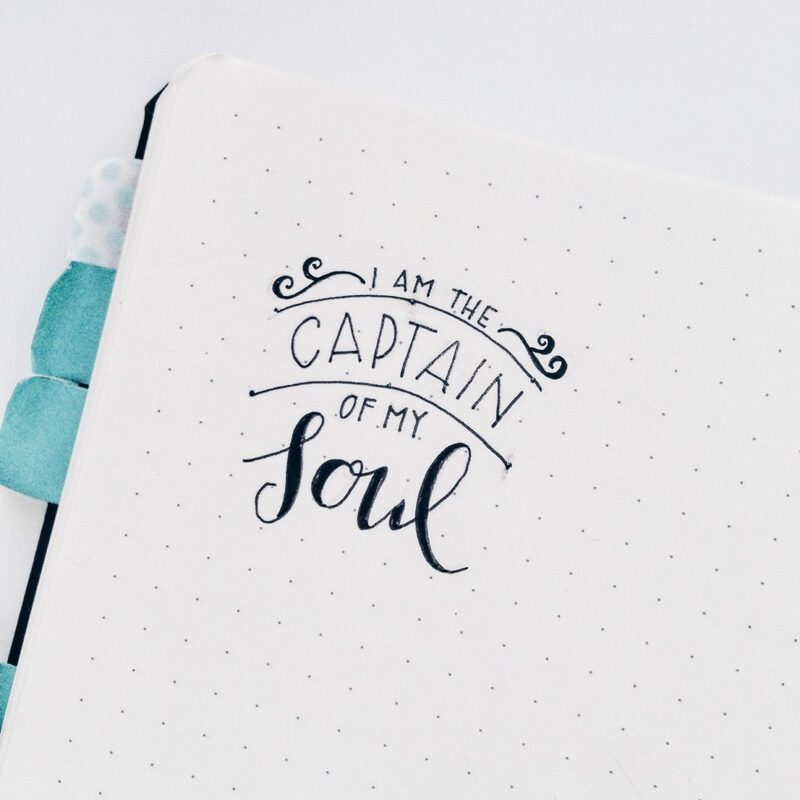 For the purpose of this blog post I’m focusing on the monthly mantra, but you will be able to apply the tactics for whenever you feel you need it. In this blog post I’m going to share some of my own growth mindset changes I’ve done. Hopefully that will help make this concept a bit clearer. Please keep an open mind as we all have different issues and my issues might seem small or non-relevant to you. But as everything here in life, it’s subjective and I hope that by sharing it will help to clarify the process. One of my bigger issues is that I tend to think a lot about work when I’m not at work. Not only what I have to get done but also just thinking of stuff I’ve done or what happened that day (without any big positive or negative feeling connected to it). I think this is mainly because I spend so much time at work (as most of us do). Since these thoughts take up mental space and energy that I would like to place somewhere else I knew I wanted to minimize them. So, my process is that whenever I realize I’m thinking of something that is work related I will shift my thoughts to something else, somewhere I do want to place my energy. In this case it isn’t a ”mantra” per se that I focus on, but rather that I switch what it is I’m thinking about. So whenever I realize I’m thinking about work I say to myself ”thank you, I hear you” then I switch my thinking to this blog, which is where I’d much rather place my energy. If you decide to try this out you should know that in the beginning the negative thought will most likely come up very often, sometimes they pop up every other minute. You probably had those thoughts that often before as well, it’s just that then you were probably not as aware of them as you will be now. I can assure you that it gets easier and easier the more you do this. In the beginning I could let the negative thought run around in my head for a looong time before I even realized what was going on and remembered I had a mantra I was supposed to think about. But for every time I remembered and did it, it got easier and easier. All of the sudden you’ll notice that the negative thought doesn’t show up as often, and in the end it will disappear. At least for a while. Some negative thoughts might resurrect sometime in the future and you might want to bombard it with positive mantras again. That’s just the way we humans work. I think of the negative thoughts as our ego, trying to keep us down and keep us small for our own protection. It’s not doing it to be mean, it’s just trying to protect us the best way it knows how. And the ego will never fully go away, it will flair up from time to time. This is something I’ve done on and off for years, i.e. coming up with mantras to keep my ego in check. But I’ve never before written them down like this, nor deliberately come up with a new mindset shift or mantra as a monthly theme. Before I would come up with a mantra whenever I was struggling with something, when I realized my ego was getting way too much room in my life. By writing them all on one page it would be super easy for me to find them when I needed a reminder of the current month’s mantra. By writing it down it would force me to be a bit more concrete, both of my negative mindset and the mantra. It couldn’t be all fluffy and long ramblings. It needed to be to the point as I wanted it to fit on one, max two, rows so that it would be easy to remember. During the course of a year I would have changed 12 mindsets to something more positive which is pretty amazing! It would be pretty cool to at the end of the year be able to look back on all those mindset shifts I’d made! It will serve as a reminder. It’s only April now and I’ve already gone back to see what mantra I came up for a previous month when I was working on my ”perfectionist nature”. And that is something I think will happen quite a lot as the negative thoughts will continue to flare up. It will take a long time to get them completely turned around to the positive mindset. This is my ”Build New Habits” or ”Growth Mindset” collection looks like. I simply write down what it is that I want to change and then my mantra. Well, experts say it takes 21 days to form a new habit. By doing this mindset shift a whole month (29-31 days) it gets time to sink in and stick. And it really does, I notice a great difference! However, as I mentioned above I do have to go back to previous mantras from time to time because they aren’t 100% incorporated into my thinking. At the beginning of each month I think about what negative thoughts, or thoughts I feel aren’t serving me I’ve had recently. Then I pick the one that’s been getting most attention lately (i.e. the one that seem to pop into my mind a lot) and go with that one. I write down how I currently think, i.e. what I in this post call the negative thought. It can in deed be a negative thought, but it can also be a thought or feeling that seem to drain me of energy, or simply just something that I spend way too much time thinking about and which doesn’t bring any kind of value. I really work on narrowing the negative thought down to a sentence or two, to really get to the root of the problem. I either phrase it as the actual issue I want to work on, e.g. ”I want everything to be perfect” or as what it is I want to change, e.g. ”stop wanting everything to be perfect”. My next step is to think about what I could say to myself to get me out of that negative mindset and make it productive and positive instead. This can be a mantra, i.e. a sentence that I feel is uplifting or somehow helping me switch my mindset. But it can also be that I decide on a topic I’ll focus on instead. Like my example on thinking of work at the beginning of this post. Whenever I realize I’m thinking of work I’ve decided to switch focus and think about ForeverGoodLife instead. That’s something that feels more productive, it draws my attention and brings my energy level up. Coming up with the mantra can take a while. I try to come up with a few different ideas before I settle on one of them. If you find it difficult you could imagine it was your best friend who told you what she’s struggling with. What would you say to her? I had a hard time to start using my first bullet journal. At first I couldn’t really put my finger on why that was. I procrastinated saying that I would do it the next day when I’d have a bit more time. Then the next day I would say the exact same thing. After a few days I realized what I was doing and started to dig a bit deeper. It dawned on me that it was the perfectionist in me who didn’t want to mess it up with ugly texts or creating collections I’d later realize I didn’t want or need. After a bit of soul searching and trying to put words to my feelings I phrased it ”stop wanting everything to be perfect”. Then I continued by coming up with positive or motivating things I could say to myself to get out of that perfectionistic mindset. I came up with a few different ideas and phrases like ”perfection is the enemy of creativity” and ”perfection is boring”. Then I remembered I had seen ”perfectly imperfect” somewhere and I really love that phrase. And I also love it when people are authentic and share their imperfections. And from that I came up with a phrase that I felt would work for me, i.e. ”imperfections brings personality and life”. So that when I mess up I will take the positive spin and think that it’ll bring more of me into the journal, it won’t be stiff and boring as it might be if everything was utterly perfect. And that totally worked, and continues to work, for me. I cracked open my bullet journal and started using it. And whenever I make a mistake I think of that phrase and most often it helps me. 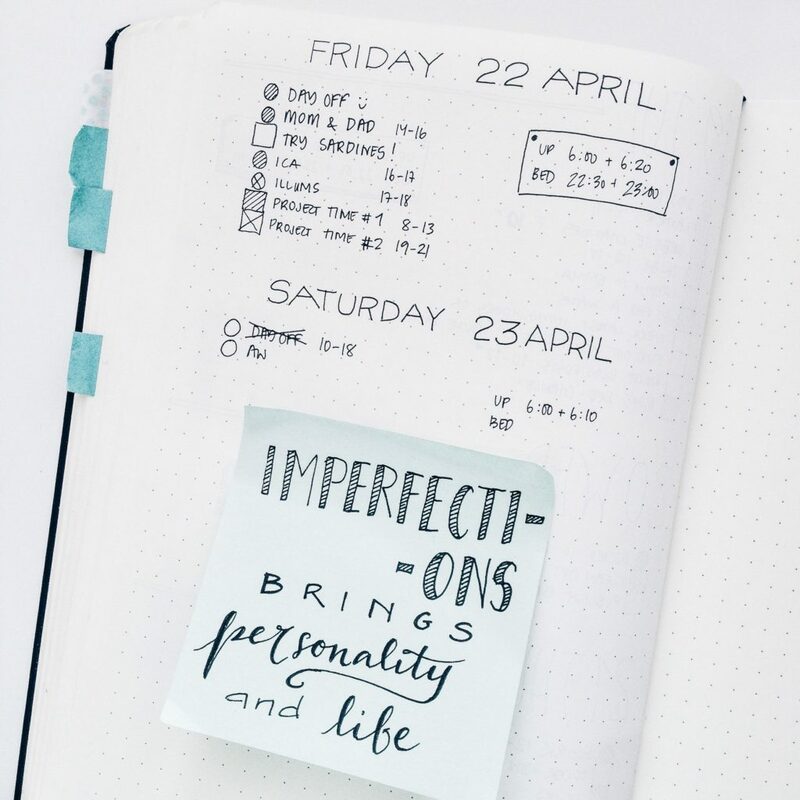 You can read more about it in the blogpost Bullet Journal Mistakes + How to survive them (of course the title is supposed to be a bit funny and not to be taken literally ;). Have you thought about tackling negative thoughts before? What does your process look like? I find this topic super interesting and I’m so happy to have found this process that works for me. But I’m always open to change things up and try new things. So if you’re open to share I’d love to read your comment here or on social media. * Negative thought – When I talk about ”negative thought” in this blog post it’s an abbreviation for anything that holds you back, drains you of energy or simply an idea or thought you don’t want to have and you probably spend a lot of time thinking about. In reality, it’s the ego in action. The ego is not mean, it’s just trying to protect us the best way it knows how. From disappointments, failures, negative emotions.